Easter is my favourite festival of the year. With our history as a British colonial outpost, Australians have long suffered through Christmas, maintaining northern hemisphere food traditions in the boiling heat of summer. The translation of a northern springtime Easter to a southern hemisphere autumn makes much more sense though. Eating loads of chocolate in autumn is a much better match than roast turkey and boiled fruit pudding in summer. Autumn is the best, all of the end of summer produce is still around and the autumn fruits and vegetables are coming on on board: pomegranates, pumpkins, apples, spinach… it’s all good! It’s also a much better time of year to bake cookies. Even though I bravely maintain a cookie baking tradition in the high heat and humidity of our summer Christmas, baking for Easter is a much more sensible and pleasant experience. 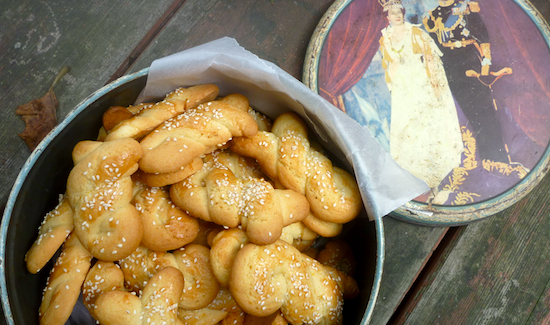 I made these paschalina koulourakia for the first time last Easter, and they were an absolute revelation; they are such a simple biscuits but exceptionally good, too good to keep for just for Easter-time. I made several batches this year as part of my Christmas cooking baking spree. 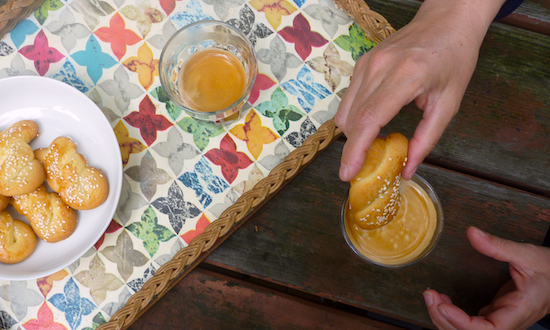 They’re not too sweet and make an excellent dunking biscuit for coffee, tea, or even hot chocolate. They keep well, so they’re great to stash in a tin and take away for the Easter break. I tend to overdose a bit on chocolate over Easter, so these cookies, fragrant with orange zest, vanilla and the subtle nuttiness of the sesame seeds are a delicious antidote to all that chocoholic excess. Cream butter and sugar until light and creamy. Grate orange zest over bowl (so all the orange oil goes into butter) and mix through. Add vanilla essence mix and two eggs and one yolk, one at a time and beat until well combined. Whisk baking powder through flour, then fold flour through butter and egg mixture. This should make a firm, but not sticky dough. Gently knead a bit of extra flour through if your dough is too sticky, but be careful not to overwork your dough. Mould dough into a ball, wrap in plastic wrap and place in refrigerator for 30 minutes to one hour, until dough is firm. When you are ready to bake your cookies. Pre-heat oven to 180°C (160°C fan-forced). Take your dough and, using a tablespoon measure, scoop out tablespoons of dough and roll into a walnut sized ball. On an unfloured bench, roll out dough into 20 cm lengths, fold in half and twist dough over once. If it is very humid, the dough will get a little sticky but don’t flour the bench because the dough needs some friction to roll out. Cover baking sheets with baking paper, place cookies on baking sheet about 5 cm apart. 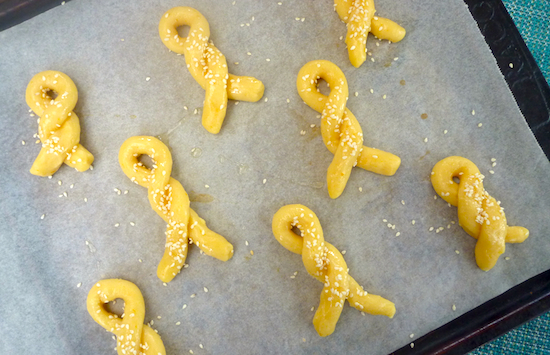 Whisk remaining egg white and brush cookies with egg white, then sprinkle with sesame seeds. Bake in oven for 13–15 minutes, turning the tray half-way through to make sure the cookies bake evenly. 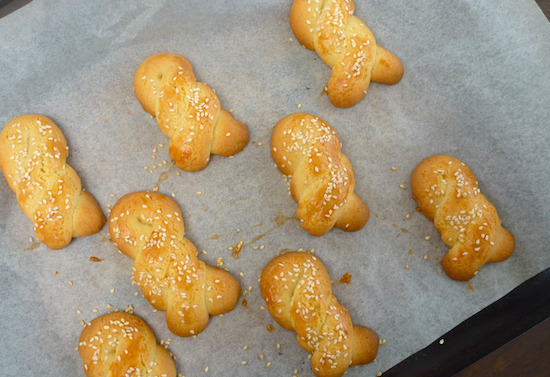 These cookies can burn quickly, so keep an eye on the first batch to get the timing right. Let cookies for 5 minutes on tray before transferring to a wire rack to cook completely. Cookies will keep well in a tin for at least a week. You made these too?? That’s great! Thanks for trying my recipes 🙂 They look beautiful! All your cookie recipes are fantastic Magda. They are the best aren’t they. 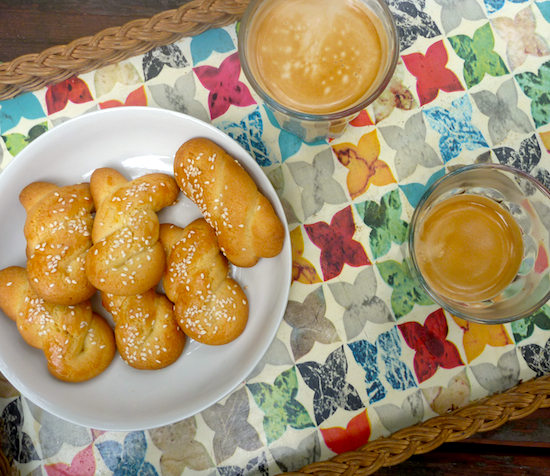 My Little Expat Kitchen is the best blog out there for Greek Cookies.